Looking for a large LED TV under 50000? You are at the right place, we have compiled a list of top 10 best TVs under 50000 available in India as of March 2019. All latest LED TVs have been added to the list. We have covered LED TVs from brands like LG, Samsung, Sony, Panasonic, Kodak, VU etc. All these brands provide high-quality products with good after-sales service. The priced of LED TVs on this list is from Rs. 35000 to Rs. 50000. So if you are looking for a LED TV under 35000, 40000, 45000 or 50000 you will find it here. The display of LED TVs on this list varies from around 40 inches to 55 inches. All standard sizes like 40, 43, 49, 50 and 55 inches are listed here. Resolution of these LED TVs is either Full HD or Ultra HD 4K. If you are going to use your LED TV in a large room or hall, you can go for LED TVs of size around 50 inches. If you are going to use it in a small room then you should buy a 40 or 43 inch LED TV. The rule is simple here, if the display size is large, there should be a larger distance between TV and the viewer. We recommend at least 6 feet distance for 40-43 inch LED TVs and 8-10 feet distance for 50-55 inch LED TVs. We have listed the pros cons of every LED TV with specifications and a brief review. Price and buy links are also provided. Prices keep changing every day so please check latest prices by clicking on buy links provided. Let's take a look at best TVs under 50000 in India. So this was our article on the top 10 best TVs under 50000 in India. We hope it was helpful for our users. Our favorite on this list is the VU 55 inch LED TV. It priced little above 50000 but offers a large 4K display and Smart TV functionality. So if you need our opinion, go with it. 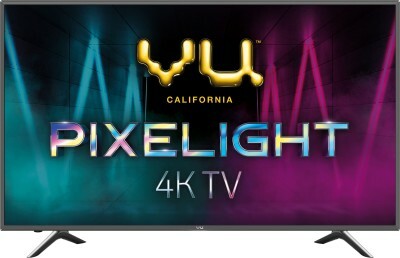 Here's the link to buy it: Buy VU 55 inch 4K LED TV from Flipkart. If you don't want to go with VU, then Samsung 49 inch smart TV is our second favorite. Samsung products have great quality and they have excellent after-sales service and that's why it is our favorite brand in consumer electronics.